Season 4 Sneak-Peek! THE VOICE with Usher and Shakira! THE VOICE – Success with a proven formula – picking artists that are already somewhat established. EXCLUSIVE Set Report! Spoiler Alert! “The Voice” viewers just said good-bye to season three which earned a second win for coach Blake Shelton. Fans learned early-on in the season that Christina Aguilera and Cee Lo Green would not be returning for season four and that Shakira and Usher would be taking their spots. It’s no wonder – “The Voice” is truly a machine with barely any down-time. NBC is already pushing season four ads which began filming before season three ended. Blind auditions for “The Voice” season four started filming back towards the end of October 2012. HOLLYWOOD JUNKET attended an extended filming day which took place at Sony Studios in Culver City, Ca. Audiences were treated to this sneak-peek of the new coaches Shakira and Usher. The banter between the coaches seemed unaffected in the midst of the two new additions. Blake and Adam continue to share a love/hate relationship and the new lady on the panel, Shakira was affectionately teased by Adam and Blake who consistently repeated her famous lyrics “hips don’t lie.” An on-looker in the audience commented that Shakira’s wig looked natural and pointed out that Shakira had to wear a wig because she can not color her hair during her pregnancy. At the time of filming the day we were on set, the blind auditions for season four were well under way. The coaches at that time only needed one to two more artists each. Blake was down to only one spot left. Several of the more memorable contestants that day were: Patrick who sang “Walking in Memphis”; Brandon who sang “With a Little Help From My Friends”; Ginger was called “breathy” by coaches; and Jenny is an eighteen-year-old singer with black hair. Blake Shelton decided to give his last spot on his team to a country singer named Savannah Berry. She was deemed to be special.. and now I can see why. Berry already has a following on YouTube where she said she started posting videos since sixth grade. Already a Nashville veteran, Berry is sure to be another Team Blake stand-out contestant for season four. 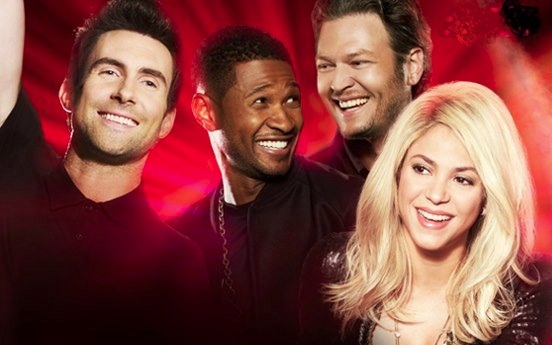 “The Voice” season 4 premieres March 25, 2013 on NBC.